The concept that math is logical, embraces everything I love about mathematics. I tell my students all the time that math is just like a big puzzle ready to be solved. I can help my students to understand that math makes sense by helping them construct their own understanding. In order to prepare our students with 21st century skills it is import that our classrooms shift from teacher centered, instructionism to a learner centered, constructivist pedagogy. Our classrooms should be tech-embedded and inquiry based with problem-based learning. Classrooms should be environments that engage learning. Classrooms should foster creativity and curiosity. Teachers should use content to teach skills that students will need to be successful. Students need to be creators not just consumers. They need to be able to problem-solve. They need to learn how to fail and succeed. They need to learn how to collaborated and communicate in this global world. Allowing students to construct their knowledge is important if we want to facilitate deep learning and true understanding. Constructionism is not a new theory of education. In fact constructionism has historic roots in education. However constructionism as we know it in today’s form can bring many new ideas to the table. My lesson, Chocolate Bar Math – Whole and Parts, is an example how we can use problem-based learning to help student construct understanding. We as human have all been active participants in our learning process, even from very early stages of development and it should not be any different in the classroom. The child should be the center of the learning process. Classrooms should be a place where students learn, invent, explore, teach, collaborate, and share. Open education, brain-based learning, differentiating instruction, problem-based and project based learning are all examples of how classrooms can make the shift from teacher lead classroom to a student centered constructionism approach. The Reggio Emilia Approach which “is highly sensitive to local culture and community and respects the rights, needs, talents and questions of children” can also be included in the constructionism approach (Martinez & Stager 2013). It’s not a new idea to use hands-on authentic learning projects in the classroom; many great teachers do. It’s not even a new idea or theory that students can learn by actively constructing knowledge through the act of making something shareable. The theory of constructionism is recognized and valued but not put into practice enough in our schools. Seymour Papert’s idea of constructionism in relations to technology brings a lot of new ideas to the table. Schools are resistance to change but the ideas of allowing children to experience powerful ideas of mathematics and science is becoming more common in classrooms today. Papert 1972 paper “Teaching Children to be Mathematicians vs. Teaching About Mathematics” advocated for student to have real experiences rather than being taught just a subject. 40 years later this concept is still a new idea in many classrooms across the country. By applying Papert’s theory we can use gaming, programing, robotics, media making and much more to create mathematicians. Why not teach true computer science in kindergarten. Why not teach students to code and program? Why not let students learn by making, tinkering and engineering? In an article I wrote for EdSurge I demonstrate how I have been able to apply concepts, principles, theories and research related to human development. 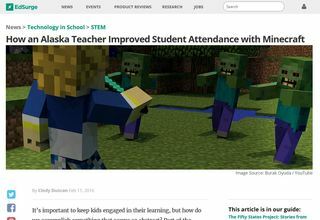 In the article I shared with others how I used my students’ interests to improve learning. If we want to help students to construct their mathematical understanding we cannot merely teach the procedural learning of mathematics (learning the processes, or algorithms by rote). We must also teach conceptual learning. For many teachers this is a shift from the way they learned math when they were in school. This is might even be a shift from the way they were taught to teach math in college. This can create a challenge because children need to understand the concepts and meanings underlying the operations as opposed to merely learning an algorithm. Teaching students to be mathematicians, demands knowledge and skill beyond what is visible from an examination of the curriculum. ​Martinez & Stager. (2013). Invent To Learn: Making, Tinkering, And Engineering In The Classroom. .
Theories of Child Development and Learning. (n.d.) Theories of Child Development and Learning <http://www.ncrel.org/sdrs/areas/issues/students/earlycld/ea7lk18.htm>. A math lesson I wrote: Chocolate Bar Math – Whole and Parts demonstrating my ability to utilized research-based theory and evidence to explore a problem in the classroom. An article I wrote for EdSurge demonstrating how I used my knowledge of student development to improve learning in my classroom..